Trusted by over 200 million parents worldwide and 5 star rated on the Educational App Store, Toddler Fun Learning brings their fun and educational videos for babies, toddlers and children to the App Store. Watch our lovingly-made British content Ad-Free, download videos to watch anywhere, and try our innovative parental timer which lets our characters tell your child when to turn the screen off. Sing-a-long to our songs and nursery rhymes and learn with our popular Number Zoo and Gecko’s Garage series. - 100 % Ad-Free and Safe. - Lovingly-crafted original videos, all with an educational element. - Adventure Mode - Download videos to watch anytime, anywhere. - New kids' videos every week. - Avoid tantrums and meltdowns with our innovative parental timer, which lets our characters sing goodbye to your child when time is up. - Login on iPad, iPhone and Apple TV. - Trusted by millions of parents worldwide. Gecko's Garage: Help Gecko and the mechanicals fix big vehicles and trucks in the friendly neighbourhood garage. Number Zoo: Our popular counting series for toddlers. The Zorbits: Our STEM learning series: learn about gravity, the solar system and more with Korky, Zaggle and Goobers. Nursery Rhymes and Original Songs: sing-a-long with our classic British Nursery Rhymes including The Wheels on the Bus and Humpty Dumpty. • Watch the latest 3 videos, and first video from each playlist for free. We are Toddler Fun Learning and our mission is to educate children across the world through safe, fun and engaging digital content. 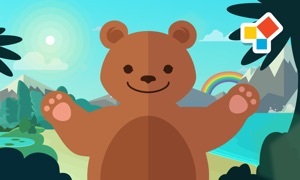 Toddler Fun Learning is a family-run production company with the sole purpose to make videos for children that not only look fantastic, but also help your little loved ones with their counting, spelling, vocabulary and lots more.